The Colorado Desert has been swarmed with Hollywood's glam set, Victoria's Secret Angels and the Insta-famous, as 2016's Coachella festival is underway. Argentinian artists Roberto Behar and Rosario Marquardt's have created a silk flower sign which reads: Bésame Mucho, translated as Kiss Me a lot. The piece is inspired by a 1940's song. Consuelo Velázquez, a teenage songwriter who thought kissing was a sin, parlayed the adoring phrase into Mexico’s most popular bolero, recorded first by Emilio Tuero, famously by Lucho Gatica, and later by scores of others, including Tino Rossi, The Beatles, Herb Alpert, Plácido Domingo, Diana Krall, and Andrea Bocelli. Lai's stellar 52-foot-tall creation is a tribute to Leonard Cohen's Tower of Song. The model has been made using shapes which have been inspired by skyscrapers and comes alight at night. 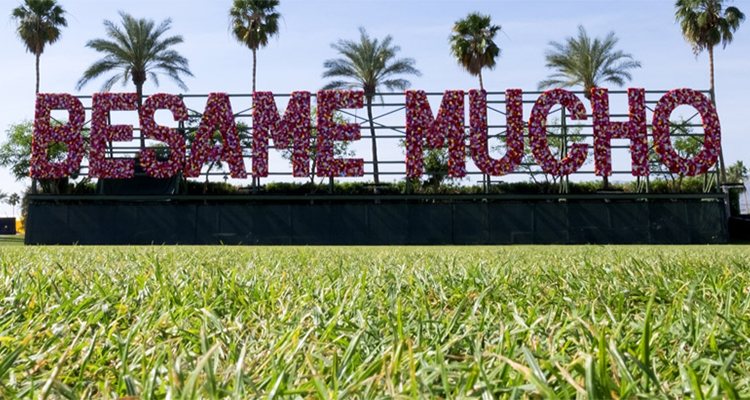 Coachella-based artists Armando Lerma and Carlos Ramirez, known collaboratively as The Date Farmers, have created Sneaking Into The Show, a Chicano Pop Art-inspired totem which portrays a pair of migrant workers. Cuban artist Arrecheaha has created six yellow lawn chairs which have been stacked with Soviet-era apartment towers. The name of the work derives from the storm that devastated New Orleans in 2005. Bose's creation for the festival features balloons which have been tied together and lit using LED lighting. The balloons sway with the winds of the Colorado Desert.